SIM card message restorer software recovers contact numbers (along with contact name) and text messages from mobile phone sim card memory which have corrupted or deleted due to virus or worm infection, human mistakes, logical errors, improper sim card usages, hardware or software malfunctioning, blocked sim card, mobile battery failure, erased phone book directories and many more reasons. GSM mobile phone SIM card data salvage program can be installed on any windows operating system including windows 2000, windows xp, windows vista, windows 7 and many more. SIM card SMS retrieval utility provide full details of mobile phone sim card including IMSI number, card identification number and service provider name along with location of the sim card. 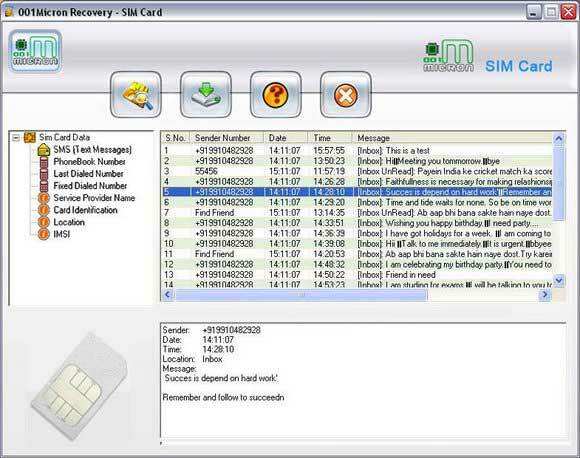 SIM card message restore utility provides GUI Interface with inbuilt help manual, so does not require any technical skills to operate the sim card data recovery software. Sim card SMS recovery software is very cost-effective product as compared to other complex and costlier data recovery products. Advanced SIM card data recovery application restores data even if SIM card is not detected by your mobile phone device. GSM mobile phone SIM card SMS rescue software provides step by step installation with systematic help manual. SIM card data revival software recovers and restores all important contacts numbers and text messages along with the contact name from mobile phone sim card even if sim card is corrupted. Features: * SIM card data recovery software can easily read the details of stored contact numbers along with their contact name. * SIM card SMS salvage program provides full support to GSM technology based mobile phone sim card memory. * SIM card sms recovery tool recovers encrypted text message and phone book contact numbers which have corrupted due to virus or worm infection. * SIM card data rescue utility provides GUI interface, so technical and non technical users can easily operate the software. CF Card Data Recovery Software from Finalseeker is highly efficient and powerful tool that enable user to recover important data easily from corrupt or damaged CF Card. Digital camera snap recovery utility retrieves all sorts of encrypted photos. Digital camera picture retrieval tool is easy-to-use, powerful image recovery application exclusively designed to rescue digital images from digital media storage devices. Flash Drive Data Recovery Software is efficient data recovery tool to recover lost files from damaged, corrupted &amp; formatted flash drive, hard drive, memory card, pen drive etc. It can easily recover data deleted using shift del keys. Creative files recovery program for windows recoups entirely ruined official data within simplest method. Handy Data Retrieval Software endorses inherent superior disk drive scanning manner for finding and reviving each mislaid significant file. This site does not contain serial number, crack, keygen SIM Card Deleted SMS Recovery serial number : serial number is the simplest type of crack. A serial number(cdkey,product key,etc) is register the program as you may already know. a crack or keygen may contain harmful software. If you cannot find the exact version you want, just give it a try. for more information read .nfo/.txt/.diz file include in zipped file.